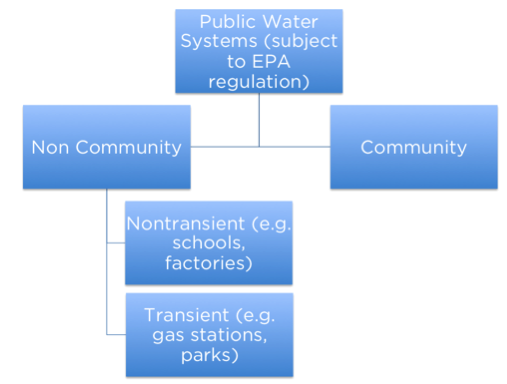 There are several different types of water systems in the United States and are categorized as either community or non-community. A community water system (CWS) supplies water to the same population year-round. It serves at least 25 people at their primary residences or at least 15 residences that are primary residences. Of the roughly 155,000 water systems in the U.S., community systems account for about 52,000 and provide water to more than 286 million Americans. Since community systems are the class that WaterSmart works with, we’ll stick to discussing those moving forward. Most obviously, small systems with a modest number of customers have a limited revenue base from which to finance their operations. A vast majority of these small systems are in rural areas where customers tend toward the lower end of the socio-economic spectrum. This means that small utilities are particularly challenged to engage customers and pass rate increases to fund critical infrastructure investments to maintain reliability and quality. Many small communities face stable or declining demand and have few prospects for economic growth. Unlike many urban or suburban suppliers that can look to the future for new customers, rural systems don’t have the luxury of system growth to support ongoing system rehabilitation investments. The resources needed to manage payments, customer support, financial operations, and other back office functions are often stretched and processes are highly manual. These functions are not performed at scale, are under-resourced, and are thus ridden with inefficiencies. An underlying challenge for these smaller systems is that the industry network of vendors for everything from pipes and pumps to modern data analytics and customer communication platforms is focused on serving the largest (and thus most lucrative) water utility customers. With long utility sales cycles, it makes sense that vendors focus limited go-to-market resources targeting the biggest water suppliers, thus leaving many of the smaller utilities underserved. Also, these vendors price their products in a manner designed to extract as much revenue as possible from the largest customers. While this business model makes sense from the vendor perspective, the inherent scale differences between the few largest and many smaller suppliers leads to a significant imbalance in services designed, priced, and targeted to smaller water utilities. 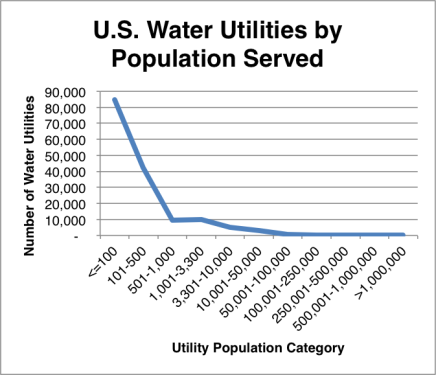 Water treatment and delivery is a highly capital intensive endeavor and there isn’t the possibility of creating a water distribution grid similar to the nationally interconnected electric grid. Unlike electrons, which are very light and relatively easy to transport, water is too heavy and expensive to transport over long distances. Therefore, in practice, we are stuck with water distribution systems that rely on local sources of supply to meet the needs of regional communities. But there are many other aspects of water utility operations that don’t rely on physical infrastructure. Everything from billing, payments, and customer support depend on information technologies and these services do not require physical proximity to the end-use customer. While it is generally true that water supply must be within some relatively short distance from the customer, the systems and people that provide back-office services can be nearly anywhere in the world. This is the area that is ripe for consolidation within the water utility industry. If smaller utilities band together to negotiate and offer these information services at scale across many different communities, service costs per unit will decline. This generates better operating margins for utility managers and provides more consistent quality of service to end-use customers. There are a number of factors that have conspired to discourage greater consolidation within the industry. As most water utilities are municipally managed, communities have an understandably strong sense of pride in their water systems and often are uncomfortable with the notion of ‘outsourcing’ certain aspects of operations. In addition to the emotional connection to providing reliable water service to the local jurisdiction, municipal operators provide jobs to members of the community and no city council member or mayor wants to send local jobs to a centralized operations center, even if it results in lower costs and higher service quality for residents. In addition, for this model to work at scale, water consumption, service address, billing, and other customer specific data needs to be delivered to centralized customer information and billing systems in a consistent, repeatable format. There is a wide range of existing platforms from a large set of solution vendors in addition to the many homegrown billing, payment, customer relationship management, and communication systems that are found throughout the industry. Transitioning multiple water suppliers to systems capable of consistently interfacing with each other is a daunting challenge. Future consolidation within the industry is inevitable as operations and capital costs continue to rise and the long-term benefits of scaled, back-office operations become more apparent. But what can smaller communities do in the short-term to gain some of these benefits at low cost? Fortunately, a new generation of data analytics and customer engagement technologies is emerging, built on years of development experience and feedback from larger water suppliers. These systems offer all of the digital communications capabilities found in modern customer facing service organizations including web and mobile applications, email, text messaging, as well as automated voice and interactive voice response features. These communication tools are built on the back of robust data analysis platforms that support modern customer relationship management interfaces to help utilities proactively communicate with customers, accelerate call resolution, reduce payment delinquency, drive improvements in operational efficiency, and inform operating and capital investments by better forecasting the outcomes of various programs. While this new breed of technologies does not resolve the fundamental fragmentation problem, it begins to bridge the gap between large and small suppliers and addresses the expectations of end-use customers regarding data access and transparency. And in an industry that is known for its risk aversion and slow evolution, these advancements should be hailed as a victory for the little guys.